Comments have been closed on this post. Email me if you have any comments! 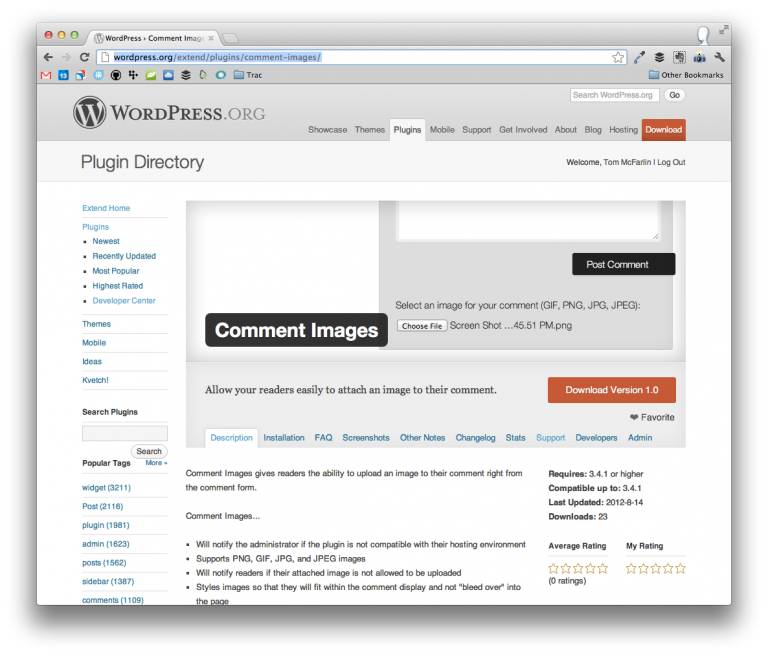 Comment Images For WordPress is a plugin that – at the risk of sounding redundant! – allows readers to upload images to their comments. Ultimately, it gives your community the ability to share a single image or illustration to support whatever they have to say. For the most part, the plugin came out of a conversation that I had with a few people at a recent meetup – they wanted the ability for their visitors to share images with their comments, and wanted to share images with their comments, but lacked the ability to do so. If the plugin is incompatible with the current hosting environment, the administrator will be notified and the plugin will not give users the option to upload an image. Readers may upload PNG, GIF, JPG, and JPEG images. The plugin is fully localized and ready for translation. Be sure to checkout screenshots of the plugin in action, too. You can view install it from the WordPress Dashboard or grab a copy on the plugin’s homepage. If you’re a fan of the plugin, have received some support via email or the forums, or want to continue to help develop the plugin, you can also donate here. Beastly! …We’re just one step away from turning wp comments into #meme-centers! Ah, man. End game discovered! jpegs are not attaching. No notifications. Is it my theme: Tweaker2. I hate to change it. But I see that the author’s site is gone. I tried to check out the theme that you mentioned, but I got a 404 when I tried to load the page. Try using a different file type. If that works, let me know and I can resolve it. Try using a different name for the file. If that works, also let me know. How large is the file that you’re trying to load? There’s always a chance that it’s your host not permitting the upload – if none of the above work, this may be the case. Let me know – let’s see what we can do to get it working! Thank you for you attention. Turns out it was settings in the plugin Spam Free WordPress. I should have seen this. Where’s your donate button? I’m self-employed, too. Sure thing, Paul. Thanks for the follow up. You can find the donate button right here. Which theme and/or theme author are you talking about? Awesome plugin. Works fine with chrome, but I’m having some wierd issues with Firefox and IE, the upload doesn’t work in this browsers. Is it a bug or am I doing something wrong? I’m going to take a look at this – are you on Windows or Mac? If I can pinpoint it, I’ll release an update as soon as possible! Thanks for shooting this to me, btw. Actually, I just committed an update that should resolve your issue – it’ll show up in your Dashboard soon. Let me know if you still experience anything! I’m on Windows. I’ll try your update and let you know if it fixes the problem. I downloaded the plugin today and am occasionally receiving the following error when trying to add an image to a comment. Possibly! Let me know what version you’re using and any recreation steps and I’ll do what I can to supply a quick fix. 1. What version of the plugin are you using? 2. Does the message appear when you attempt to upload a file, or has one not been selected? If one *has* been selected, what’s the filename? how bout adding upload via ajax? This is something I probably won’t bother doing because the comment image is appended to the comment content itself. Doing it via Ajax would require submitting the entire content by ajax. If that were to happen, we’d have to be able to detect when a user is done writing a comment – that’s tough :). So it’ll probably remain being submitted once the ‘Post Comment’ link is clicked. What type of file are you trying to upload? Perhaps a better question is what is the full name of the file that you’re trying to upload? The “Heads up! You are attempting to upload an invalid image. If saved, this image will not display with your comment.” is right there before entering any image in the “Browse” box. The “Heads up! You are attempting to upload an invalid image. If saved, this image will not display with your comment.” is there as soon as I go to the “Post Comment” page…I always upload JPG..Thanks for your help! 2. What’s the link to your blog? If it’s linked to your username in the comment, setup me up an account to leave a comment and I’ll check it out. This also happens to me when I try to comment on pages instead of posts. Seems like comments of pages are not exactly like posts. Vitor – this has been resolved in the latest update to the plugin. Make sure you’ve got 1.3 and let me know if you’re still having problems. Just testing out the plugin now. If 2 comments in a row contain images, the first image disappears? Any idea on how to fix this? Got this bug resolved – the update should appear in the Dashboard soon. Working fine but only one weird thing. The image does not show up in the comments during moderation. If approved image is present in comment. Even after approval image is still not visible in comments moderation. Otherwise I like it – thanks! James – noted! I’ll have this resolved in a future update. Thanks for the heads up – P2’s a bit more of a unique theme than was I thinking when I originally built this, but I’ll add it to the list of things to look into for a future release and see what I can do. Great plug in, and great job! I’ve been looking for a plug in that could do something like this. I especially like how well the images resize when using a responsive theme. The plug in is great as is, but it would be 1up’d if there was a way to disable images in comments on a post by post basis. Being able to post an image in the comments works great for this type of post, but I don’t want people to be able to do it every time. Thanks for the great plug in, and being so quick with keeping it updated. I’m looking forward to finding other ways to use it! Being able to display the plugin on a post-by-post basis is a great idea. I’ll make a note and see what I can do in one of the upcoming versions! Love seeing it used in the wild like this, too :). Hi and thanks for a great plugin! Was wondering if you were able to add the functionality to turn it on only for certain posts or pages. Yep – it’s in the latest version that’s available in the WordPress Plugin repository. It should appear as an update in your dashboard if it hasn’t already done so. Yes, I just saw it, fantastic! I see it’s only in the Posts. Is there a way to add it to Pages as well? Not in the current version. I’ll add this as a feature request, though. Fantastic, look forward to it! Thanks again for the great plug in! That particular issue probably has to do with the image either not being successfully uploaded or linked improperly (by using an image tag). Either way, I’ll make a note! Will consider the hot-linking issue, though I think there’s a case to be made that this resides with the webmaster’s access rules as the same could be said about all the images on the site. Double-check your spam folder – everyone else seems to be doing fine. Let me know! This would require some custom development. Shoot me an email if you’d like some help with this. Hi Tom! Thanks so much for this amazing plugin. It’s a simple functionality but it really does wonders to this new initiative I’m planning for my blog. Can I check if you will adding an option to enable/disable the image upload option for selected posts? I only want to use the image upload option for certain posts, and not all posts (for obvious security reasons). Hey Celes – thanks so much for the comment. This is a feature request that I’ll add and see if I can’t get it into the next release. Right now, I don’t have a date as to when that may be, but I’ll be sure to update this blog (and the plugin will update itself, of course :) when there’s a new version. Killer idea for a feature – thanks for sharing it! Thanks so much, Tom. :D I would like to inquire – If I enable a plugin for the month of October, and my readers upload images to their comments for the month of October, what will happen if I disable the plugin during November? (a) Will the images posted with the comments during October be removed? (b) Will the images posted with the comments, as well as the comments themselves, be removed? (c) Or will nothing happen and the images/comments remain intact? Separately, is it possible to engage you for custom tweaking of the plugin? What are your fees like? C – none of the comments or images will be lost :). Shoot me an email with what you’re looking to have customized and we’ll talk! Sure! I’ve just sent you a mail via your contact form. Ah, configuration mistake on my end. Try once more and let me know! Donation complete. Thanks for this plug in. Got it – thanks so much, I really appreciate it. In the current version, there isn’t but should be applying styles so that images aren’t overflowing the comment list at all. I’m collecting a list of features to add in the next version, but it may be a little while before I’m able to get back at it. I added your plugin, and it doesn’t work. When I activate the default theme by wordpress it works. There has to be some sort of conflict with the theme I’m using. Do you have any idea why that is happening? My guess is that it’s happening with comment_form, but that’s the best I can offer without actually taking a look at the theme. i get a little conflict in between “wp-jquery-lightbox” plugin and this one. when i activate your plugin image lightbox doesn’t come up in firefox. but in chrome it works okay. i’m sorry this may not a fault in your plugin, but if you can suggest me something about it, like what may the problem that’s great. Shoot me an email with a link to a page on which this error occurs, I’ll take a look, and we’ll go from there! I installed the plugin and when making a comment with an image, the image doesn’t show up. Hey Blake – if you shoot me an email, I’ll see what I can do about getting this resolved. Odds are it’s an issue with the theme, but I can’t say for certain until I look more in-depth. The image upload box only shows up when a visitor is logged into the site – is this the way it’s supposed to work? No – it should work regardless. Shoot me an email with some more information along with a link to your site and I’ll see if I can pinpoint the issue. Love this plug-in. It’s like users can post without creating new pages. Great flow. My only problem is that when another user tries to reply, the text box is off to the right about 90% off screen. Any thoughts? This likely has to do with styles from another plugin or theme interfering with the plugin. Contact me and I’ll take a look. Tom others have mentioned that the images are not viewable in the comments until after they are approved. Sometimes I need to edit an image before approving it. The uploaded images are not in the media library so I was hoping you could tell me where they are and if I can edit and reinsert them into the comment. This is on the forefront for the next version. In the meantime, you’ll find all of the images in the /uploads/ directory in /wp-content/. The images are saved in the typical year/month fashion so you’ll be able to see them there. If you end up making these changes, make sure that you save the files with the original filename. Also, thanks for the comment and keep an eye out for an update to the plugin – hoping to have an update out sometime during the holidays! Tom – nice plugin and it comes very close to solving a major problem for me. The only issue is one of visibility in the comment before approving it – on one of my sites, I have to delete about half of the submitted pics because of very low quality (we have an insect expert id bugs for folks and they send in blurry, long range pics showing a pinhead sized bug) So I’d support the request for a very visible pre-approval in the comments view. And yeah, if it works and it lets me sort images, then that’s a plugin worth paying for. Thanks. And if folks can see the pics after approving them, that too is something I can’t do. This feature is in the pipeline for the next version that I’m working to have out within the month. Keep your eye on the blog or watch for the plugin update. Thanks for the support – definitely appreciate it! Images are uploading at full res – Is there a setting to opt the file sizes? Also many vertical images are loading on their sides – How can i control this? (I have been testing photos from iPhone and iPad they are scaling OK but the file size is pretty much out of camera). Right now, there’s now way to control the size of the images being uploaded – you can adjust how they are displayed using CSS, but there’s no way to resize the actual file itself. Secondly, the “vertical images” loading on the site – can you show me an example screenshot or, better yet, a link? I may be able to offer some help with this, but need to see it in action first. I just have an important quick question for you. So far, everything is working fine, but I’m concerned about a visitor uploading a virus, malware, or some harmful script to my site. How does your plugin handle this? Does it do a virus or malware scan before the actual upload? The plugin itself doesn’t perform any type of virus or malware scan, but it only allows images (JPEG, JPG, GIF, and PNG) to be uploaded. This doesn’t mean that someone clever couldn’t come along and attempt to inject a bad file masquerading as an image, but the file itself wouldn’t be able to be executed whenever the image loads because it’s simply rendered as an image element. If it were not a real image, then it would just display as a broken image. This plug-in sounds wonderful. Is it only for WordPress.org? My blog runs on WordPress.com. Unfortunately, it’s only for WordPress.org – if you ever go that route, let me know and I’ll be glad to help you out! It’s not working for me for some reason? Like one of the the other comments made I do have the free Spam plugin but there isn’t anything enabled on it that should prevent it from working?!? Can you help? If you don’t mind – shoot me a link to your site (or a post that doesn’t appear to be working) as well as information on the theme you’re using. Would be happy to take a look! My blog is http://www.thelifeofstuff.com/ and the theme is Greyzed theme for WordPress. I just tried posting a comment with an image, but the Spam Free plugin through up an error message. The first thing I’d try is disabling that plugin to see if the problem still persists. I’ll try that. Can you recommend a different free spam catcher plugin that I’ll be able to use? I was inundated with crappy comments and spam before I installed it. I know that I can change settings to have the comments available to registered users only or I can reduce the links allowed but I think this put off comment makers. I recommend using Automattic’s Akismet. In my opinion, it’s the best spam comment plugin that’s available and it’s just a matter of installing it – it takes care of the rest. Brilliant stuff Tom … you know what you are? … you’re a superstar … Thank you!!! I am assuming that my theme must be interfering. Any ideas about what I should change? Thanks for your help. I really want to use this! Yeah – I can provide some guidance. It’s a small CSS change that will need to be made. Shoot me an email and we’ll try out a few things! Thanks so much for your help! It’s working perfectly now. I’m very impressed with both your plugin and willingness to help. Hello Tom, I am having the same problem with the image not scaling. You can see the problem on this page in the comments: http://northwestnordic.com/stevens-pass-nordic-center#comment-53. Any suggestions of what might need tweaking? Let me know if this doesn’t resolve it! Looks like that worked. Thanks so much for the help and great plugin! LOVE LOVE LOVE what you have created for us! And, I think I am in the same boat as some other people in that images uploaded are coming in at full size, instead of fitting within the comment page layout. I see that a few other people were having the same issue however I cant see what the resolution was. If you shoot me an email including a link to your site – specifically, a link to the post with the image – I’ll be sure to take a look and see if I can offer some help. I just get this message when i try to install. I use WordPress 3.4.2. Theme Twenty Ten. What can i do? This likely has to do with a conflicting plugin as Comment Images was developed using WordPress 3.4.1 and 3.4.2. I’d recommend deactivating all plugins, activating Comment Images, then activate your other plugins one-by-one until you see the message again. If and when you do see it, that would be the offending plugin. I’m also getting the “Plugin could not be activated because it triggered a fatal error.” I’ve tried deactivating all other plugins, but still get the error when I try to activate it by itself. David – what version of WordPress are you using and what version of the plugin are you trying to install? This is very interesting Plugin. But how to make automatically resize uploaded image shown in post to max 320 px with (link can be on Full Size). Hey Paul – right now, that’s not an option. It’s in the roadmap, but I haven’t had a chance to implement it yet. Love your plugin, but have a question about the image size. I know the current version doesn’t offer control over size, but images in my comments come up tiny (see http://designpracticemethods.net/?p=107&trashed=1&ids=9). For my purpose the should ideally be the width of the comment box. Ideas? And that’s making it show up small. Tom, thanks a lot for your quick response and help. Making the change to plugin.css does sound like the better solution. Unfortunately plugin.css is not showing up in the Styles list in the editor. Styles.css is the only sheet listed. Sorry for taking up your time with my noob questions, but hopefully you’ll be able to tell me where to find it. Okay cool, no worries. You should be fine making the changes in your theme’s style.css file. If you add it to the bottom of the file, then you should be good to go! The plugin definitely works with the latest version of WordPress. If you could, please let me know the answers to the following questions and we’ll see if we can get it sorted! – What version of my plugin are you using? – Have you tried deactivating all plugins save for the one that isn’t working and see if that resolves the problem? – If so, can you please provide a link to your site? – Please do not provide me the login credentials to your site as there are legal implications around this. It seems than when your plugin is active it causes that any plugins upgrade notices in the dashboard do not show. When you deactivate the plugin the notices appear. Yep – already done. Grab the update here. My site is not in English. So, I go into the plugin code and change the text. The thing is, that each upgrade I have to redo this. Can you allow to set the text in the dashboard so that it will stand upgrades, and allow to easily customize the text? Noted – I didn’t know file types were localized as well. Rather than exposing an options panel, I’ll localize these strings and then make them translatable using POEdit. Thanks for this request – very helpful. Will aim to have this done by the end of the week. Here is a screenshot of its dashboard. It offers a lot of customization. I can send you a copy of this plugin if you wish. I upgraded to 1.7. The image inserting text went back to English. In the release notes you mentioned :”Adding support for international languages in the file types”. Can you please clarify what should I do to have the text in another language so it will survive updates? Sure thing: Follow the instructions in this article and you’ll be good to go. It’s really easy and will be compatible with future upgrades. You must be kidding. I am not a developer. Just an average user. Just scrolling through the page got me dizzy. I’m not trying to make this any more difficult than it needs to be. Unfortunately, this is just the way that translations in WordPress work. Download POEdit. It’d send you a direct link to the file but I don’t know what operating system that you use. Locate plugin.po the file in comment-images/lang/. Do this just like you would open any other text file or any other file on your computer. Click on each item in the top window. This will allow you to change the English string to your language equivalents. Save the file. This will create a plugin.mo file. Upload this file to your server like you would any other file into the lang directory where the plugin.po exists. I’m genuinely not trying to make this any more difficult for an average user than it needs to be – this is just how translations currently work in WordPress. Can you use https://www.transifex.com/ to make transelations to your plugin? I am willing to do it in Hebrew. Hey Yoram – I’d be willing to do this on a contract basis; however, this isn’t how the core WordPress translations work. Because this is a free plugin and because that I try to stay as close to WordPress plugin standards (both for coding, for support, and for localization), I’m going to stick with the process they’ve recommended. I really tried. I did not manage to do it. I guess I will keep changing the text in the plugin editor each time I upgrade. I suggest you give an option to change the upload text in the dashboard like the other plugin I mentioned do. It would sure be friendlier. While that might be friendlier, it is not a WordPress best practice. Using the translation process as outline by the Codex is the industry best practice. Many thanks for the amazing plugin, The code is very nicely commented as well. I needed to change the plugin to allow zip and rars and also save the file name that was pretty simple enough! Unfortunately, this would take longer than a comment to provide. If you’re interested, I do offer custom development or consulting for this kind of stuff. Definitely more than happy to help you out. If you’re interested, you can shoot me a note here and we can talk about it. Thanks for the nice comments on the plugin! Wouldn’t better to change the code that generate the html code for the upload field? As beginner in WordPress I’m afraid there will be some problem when upgrading due to bad coding. I can provide some example and screenshot. Good question! This is usually better for an email, but the short answer is that I won’t be providing much styling for the form simply because I want the plugin to be compatible with as many themes as possible. As such, I can’t provide a lot of styling so the best thing to do is to provide the basic form and let users and/or designers / developers work on the styles. If you think it’s worth a look i can send you the relative files with this solution ready without touching your code, let me know. Another question, any future dev on ‘crunching’ the uploaded images? If the images uploaded are heavy they’ll impact on page load and as I’m permanently connected via UMTS/3G mobile network (no ADSL nor land-line) i can tell you it will ‘resize’ the great value of your plugin. I appreciate it, but for now this is how I’m likely going to leave the plugin. The justification is for several reasons. I only want the user to have as few clicks as possible. If this means include only one input field, then that’s all I’m going to do. The idea of introducing a cancel button isn’t bad, but it should only be visible after the user has selected a file and should disappear when there’s no file defined. The issue of showing/hiding the input field adds an unnecessary click making more work for the user. All that to say, I think may look into the ‘Cancel’ option in a future release. Also, yep – I’m definitely planning on adding an automatic resizing feature in future releases. It’s one of those things that I just haven’t had a chance to work on yet. Thanks for the thoughts, Stefano! Tom, brilliant plugin, any idea when to expect the update for seeing the image in moderation? Unfortunately, no – I’ve got a big backlog for this program and I’m hoping to make incremental improvements on it, but paying gigs have to take priority ;). It’ll be available for updates in the dashboard as soon as the new version drops! I try in English. A few photo are too big… how can i this help? This would need to include a change to your style.css file. Hello. Very thanks! I happy with this plugin. I have another question of this plugin. How can I the picture/photo with a CENTER position? This would require a bit of CSS. In order to provide this, I’d need to take a look at your site – it’s a bit outside the realm of standard support for the plugin, but shoot me an email and we’ll see what we can do. The recent upgrade gave great new features. In posts and comments view, it would be helpful if it would be possible to click on “Comment Image” to sort by posts and comments that have comment images. Each plugin has its own column in the comments dashboard. The issue is that the comment image displays on those columns too now. Thanks for the suggestions – as with all of them, I add them to a backlog to see about adding them to a future version of the plugin. For the issues, I installed every single plugin that you suggested, applied a fix, and tested locally. Comment Images 1.8.2 should appear shortly as an upgrade in your dashboard. The recent update fixed the issue. Many thanks. Great plugin. However it just stopped working for me. I changed the permissions on the uploads folder to 777 to test that and it worked once. Now it’s not. Any ideas? Also, I am in desperate need of my readers having the ability to leave an image WITHOUT comment text as we do ticket giveaways where user just need to leave an image as a comment. Was this added to the new version? If not, is it something I can fix? When you upgraded the plugin, did it stop working after that? Or did it stop working prior to the upgrade? This is something that’s outside the typical realm of support so if you can contact me via email we’ll see what we can do. Also, the feature of not being able to comment without text hasn’t been added yet, but it is on the roadmap for within the next two releases. I’m not sure of a timeline for that yet, though. I have read the comments and answers here about the image size and tried changing the settings in the plugin.css file located in the /plugins/comment-images directory. No matter what I changed the settings to the image remained the same size which is too large. Is there another file I should be editing in addition to or instead of this one? This should be all that’s required but other plugin and theme files can cause problems. Shoot me an email with a little more detail. I’ll take a look at your site and see what we can do! After I installed 1.8.2, I cannot post new comments. I am new to your plugin. Please help, thanks. This sounds like it may be a conflict with a theme or a plugin as this is the only reported incident that I’ve seen. Please shoot me an email and let’s see what we can do! Great plug in that we would like to use. But my big worry is that many of our readers are not tech savvy and will upload huge images right out of the camera, which will clog up our server. If you added automated re-size on upload, we would use it in a heart beat. How about making that a premium feature with a annual maintenance charge? 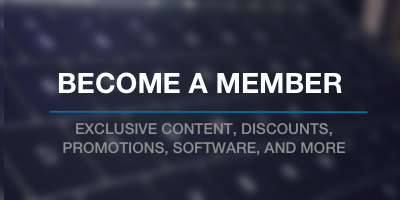 Free without, premium with. I for one would be happy to pay for that and the revenue would make it worth your while to focus more time on it. John – your use case is one of the ones that I think most about when working on this plugin. There’s a fine line to walk between making sure everything is as user friendly as possible without actually taking control away from those who are more comfortable with it. That said, I try to err on the side of less technical users, so this kind of feedback is valuable. And your timing is actually really funny as I’m beginning to move in the direction of charging for support for plugins. I’ve yet to work out the finer points, though. Anyway, I’ll definitely take your feedback into consideration and see that I can do for the next major release. Have the option to set a flag so that all comments that contain an image are automatically put in the moderation queue, even if the blog does not generally use automatic moderation. This would be the same way that WP kicks all comments with more than one or two links into moderation. This would be a great feature for site like ours that have not found moderation necessary on all comments but would like to make sure that images are appropriate before posting. As to charging for your time. My feeling is that of course you should! I really like the model where there is a free version of the plug in, so we users can get a feel for it, and then a premium version with features like these we are talking about, that we pay an annual fee for that includes a reasonable amount of support. I, for one, would be happy to pay say US$40.00 a year for a plugin like this as long as it was well maintained and supported. We had the same problem and solved it with some custom CSS in the theme limiting file upload size. Works great. 1.8.2 has issues when uploading large images. They appear in several places and look strange. I’ll take a look at it, but can you go ahead and upload what you consider to be a ‘large’ image to the test site so I can review what it looks like? This is the first I’ve heard of the issue so I’d like to see it in action to provide as much help (and updating) as necessary. This looks like it might be a theme related issue. Can you try with another theme and see if the problem persists? I can’t recreate this on my end. I have just installed you life saving plugin…. However the writing conflicts with the filed boxes and the writing of my existing comment box, is there a simple solution to this? This is probably a result of conflicts styles with a theme and/or a plugin. If you shoot me an email with a link to your site, I’ll take a look and see if it’s an easy solution. I’ve sent you three emails but it looks like they’re likely going to spam. Please double-check to see if you see them there. Regarding hiding the upload-image functionality on certain pages, until that gets added in, I’m wondering if adding a css style in my page would work. Like targeting the form and using display: none? Thoughts? And I agree with John, I would easily pay for a premium version with automatic optimizing of huge images. I’m slowly working through introducing a premium version of plugins. It will be a while before I’m able to finish this, but I appreciate the feedback! My image uploaded sideways. Is there a fix for that? Unfortunately, this has to do with the image that a user is uploading – not the plugin. They’ll need to manually rotate the image themselves prior to uploading it. This normally means that your web host doesn’t support a function that’s used in the plugin. If you want to shoot me an email with the details of your hosting environment, I can let you know if this is the problem or not. Just thought I would let you know that I am having the exact same error. WP Seeing if I can work through it. Will report back. Thanks for the heads up. I’ll make a note to review this and see if I can reproduce it in a future release. Good idea. Adding this to feature requests and will see what I can do in a future release. Thanks for changing the plugin so we can now see the images when we approve the comments – this was a big help. Now, however, I’m having a problem with people uploading huge images. They show up the right size in my blog, but the files are huge and are slowing down my page loads. Is there a way to keep people from uploading anything larger than, say, 800 pixels wide? I could introduce a feature like this, but the problem is that this isn’t a feature that would necessarily affect everyone. Instead, it’s more of a custom feature. If you’re interested in that, shoot me an email and we’ll see what we can do. Which light box plugin works well with “Comment Images For WordPress”? I don’t really have any recommendations. You’ll have to try out what’s available and see if you can find one that works best. I’ve personally never tried any of them – most of them primarily look to add a lightbox effect on images in the post since that’s where they most commonly appear. I’ll leave it up to others to share if they’ve had success, though. Is there a way to add a different file type to the plugin? I need my end-users to be able to upload and display a PDF in their comments. Got your email – we’ll chat from there! The plugin was working great. Unfortunately since I ran w3 cache it uploads the images to folder but no longer displays them in the reply? I deactivated it but still not working? Have you had this problem before? and if so how do I overcome it? Unfortunately, I’ve not seen or heard of this problem until now. It would seem odd that total cache is moving it to a new location, but if it’s rewriting the location, then that may be why it’s not showing up. I wish there was more than I could add but that’s about it. I have an issue with your plugin, its working fine for a desktop version but not for mobile version like WP Touch Pro. Comments without attached image can’t be done as we get a popup error message. Can you investigate and see if that can be fixed? Unfortunately, this is more of how the two plugins interact and it’s not an easy fix. It’s something that I’d eventually love to resolve and I’ve logged it in my development notes, though there’s no timetable as to when this particular feature will make it in. Thanks for the heads up – I do take these requests seriously and appreciate the feedback :). hello, i very much want to give my users this feature, but no matter what i do i cannot activate the plugin without getting the “trigger fatal error” message. Have tried deactivating all other plugins, switching themes (i use Platform Pro) and no luck. Any thoughts? Sorry to hear you’re having an issue with the plugin! This is the first that I’ve heard of this particular issue as it’s been tested up to WordPress 3.5.1 with no problems. What theme are you using and what version of WordPress are you using? I may be able to provide a little more information based on that. Wow, thanks for the speedy reply. My theme is PlatformPro By PageLines Version 1.6.0 and I’m using WordPress 3.5.1. As I noted earlier, I tried deactivating all of my other plugins and using other themes, such as Twenty Twelve, but still get the same message. Okay, cool – and finally, what version of the plugin are you attempting to install? Is it 1.9? Shoot me a note here and we’ll take this into email. I just found your plugin and I find it really well. A small question still comes to mind at the security upload. The script is it secure enough to prevent malicious uploads? Another thing, the images are not automatically deleted when you delete the comment or the media? The plugin only allows files in the format of PNG, JPG, JPEG, and GIF to be uploaded. This doesn’t mean that someone highly malicious couldn’t game the system, but I’ve put every safeguard in place that I possibly can to handle this particular issue. And right now, the images are not deleted when the plugin is deactivated. This is primarily so that if users opt to re-activate the plugin, the images will appear exactly as they did when the plugin was running the first time. I tried your plugIn and it worked fine. Imgs show up in the media library as well. When I delete the img uploaded via the plug in the lib it disappears from the lib but when I check the folder on the server it’s still there. Tried several jpgs. did you consider an image resize for the plugIn? The plugin doesn’t delete images on de-activation. At one point, it did, but users wanted the images to persist so if they reactivated the plugins, the images would re-appear. I was saying that it doesn’t delete images when you want to delete them: if you delete them from the lib you want them to be deleted from the server too, don’t you? At one time, yes, but I had several feature requests to keep the images on the server should they re-activate the plugin. That said, I’ll look at restoring them in the media uploader in a future version. I try to use your plugin (version 1.9) in http://fiatclub.co.hu and it is working almost well. The only weird thing is that, if I use it at any of the posts, it is working great. But if I try to upload an image at the “csevegőszoba” page (which is a page with comments), it simply can not upload anything. It does not show anywhere, no error message, nothing. I can’t really offer any suggestions without diving deeper into the issue which would require a level of support that isn’t typically offered for a free plugin. I’m happy to help, so if you’re interested, please shoot me an email! I found the solution. On the wrong page the template called the comment_form function with an array, but it could not pass the post’s ID. Now I call the function like that: comment_form(array(…),$post->ID); and it is working nice. Thanks for sharing the comment :). …and yeah, resizing is coming whenever I get a chance to work on the plugin again. It’s been a popularly requested feature! and wondered what your recommended inclusion would be to have the comments rendered with the images that are now in the comments thanks to your plugin. The plugin uses the comment_form hook, so if you’re implementing the plugin correctly, then you should be good to go. It also uses wp_insert_comment and comments_array but those should be managed by WordPress, so you shouldn’t have to worry about that too much. Hopefully this answers your question. If not, let me know (as I may have misunderstood it!). Right now the comments are there, minus the images. get_comment_meta( $comment->comment_ID, 'comment_image' ), it will return an array (say you store it in $comment_image if there’s a comment associated with it). Hi, it lloks like a piece of art. But with Responsive Theme, is not uploading or displaying any image at all. This may be an issue with the theme in question. I’d have to take a look at it which falls under premium support as I can’t diagnose (or fix it) without digging in deeper. If you’re interested, let me know. I cannot get your plugin to work on my website. It just doesn’t look like it is saving the image path to the post? Please could you take a look at the following link. This kind of support usually extends into a premium level of support. If you’re still interested, shoot me an email here and we’ll figure it out! is there a way to make the image appear in a custom comment loop? I tried a couple of things but I can’t get it to work.. It is possible, but this type of work usually extends beyond normal support. If you’re interested, shoot me a quick email on my contact page and we’ll go from there! Does the plugin work with Jetpack comments? I have installed it on my site (minimaldroid.com) activated it, “enabled” it in the post options and yet I can’t see it as an option. I wondered if using Jetpack comments might cause an issues. Currently, it does not work with JetPack comments. That’s something that I’d love to integrate, but I’ll have to wait until I have time to revisit the plugin. I have not any upload button on the http://varosvedo.hu/forum.. I can choose but not upload image. Tom, I uploaded and tried to send a very simple image, a button.jpg in my http://varosvedo.hu/forum/#comment-32 Nothing. What can I do? When this happens, it’s normally a result of a configuration setting on the server or a conflicting plugin. This is something that I can look at, but it normally goes beyond the base level of support. If you’re interested, please shoot me an email. The plugin is not working on my website. Can you help me please? Sorry about that! Unfortunately, there are a number of reasons that this plugin may not be working – could be anything from server-side restrictions to conflicting plugins or theme code. Without knowing more, I can’t offer much help. Additionally, since this is more of a one-off case, this falls more under premium support, so if you’re still interested, please shoot me an email and we’ll see what we can do. Thanks for the plugin, too bad it doesn’t work with p2 theme. That theme is very popular with collaborative/community blogs, and many of those kinds of blogs would also like to be able to add images in comments. Basically this plugin would be a good match with P2. This is one of the biggest requests that I have. I’m definitely interested in adding this feature, but since it’s a free plugin it’s pretty low on the priority chain – for now :). It’s kinda funny because what I want to do with the P2 theme, the end result is basically turning WordPress into a “chan” site. Anyways, adding images to comments without needing to visit a site like imgur and copy and paste the HTML is nice. P2 is on the roadmap – unfortunately, no plan for a release yet. How can I change the position of the input image box? I would like it is above submit Comment button. That falls under premium support. If this is something you’re interested in having customized in your version of the plugin, let me know!. How much the customization costs? Typically around $50 – but it depends on how complicated the existing theme and resolving the problems. That’s been the average rate, though. This is the theme http://wp-demo.indonez.com/Centita/. Unfortunately, that’s as low as I can go.